Social interaction on Facebook and Twitter. Deposit #1 - 100% match with a max value of $1000 and 25 Free Spins on Wolf Treasure. Deposit #2 - 100% match with a max value of $500 and 25 Free Spins on Wolf Treasure. Deposit #3 - 100% match with a max value of $500 and 25 Free Spins on Wolf Treasure. Free spins winnings is capped at $/€200. The maximum cash out from the welcome bonus is capped at $/€5,000. Having only been around for a few months and launched in 2018, JokaRoom Casino is something brand new and fresh into the market catering to Australian players. 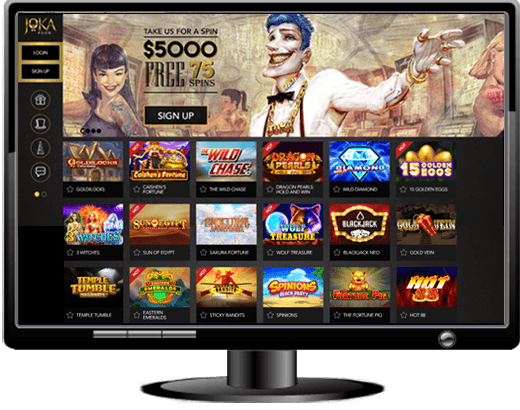 What this casino does differently in the market is that it offers a bunch of new and exciting providers, an abundance of pokies and some great bonuses and promotions. The site has something different about it because it focuses on the client. The theme revolves around the entertaining character that seems to be based on a joker. The site boasts the widest range of casino games and world famous slots and also says that it has the widest selection of payment methods. These things coupled with the casino's bonuses and promotions make it a top destination for any player in Australia looking to get online and start playing today. Perhaps one of our favourite things about the site is that you can click through to the different games, which show a full explanation of the game and how it works, and then allows you to link through to a variety of games in that category. JokaRoom Casino has partnered up with software providers such as IGTech, Quickspin and BetSoft Gaming. You may or may not know these different providers purely because they are some of the rarer ones, but that doesn't mean that the games that are offered are any short of amazing. You'll find over 140 different kinds of pokies and video slots as well as some classic slots including the likes or 3-reel, 5-reel and 7-reels. You can also find a variety of different table games such as multiple types of blackjack, different roulette games and some other, rarer games like baccarat and keno. Video poker is also something that you can play here at JokaRoom and with 17 different progressive jackpots on offer; you'll easily be able to find the right game for you. You can find games like Dragon Shrine, Ancient Giants, Sugar Pop and King Colossus, all of them slot favourites. The site is perhaps designed with mobile users in mind and one could argue that this is the best decision because most players would choose to do online gambling on the go, with either their smartphone or a tablet. When you jump onto the fully responsive online mobile site at JokaRoom Casino, you'll be presented with a neat and tidy homepage allowing you to sort by provider or by game type. The site is quick and really functions well and it seems to be designed with user experience in mind. Even though the site is fully responsive, you'll find that the desktop version will have more games than the mobile side of things. This is purely because the providers need to adapt mobile games for users wanting to spend less time loading the games and more time playing them. JokaRoom supports multiple mobile phone platforms. It doesn't matter if you're using an old iPhone 3S or an Android from back in the day, you should be alright when trying to play at JokaRoom's mobile casino. You can also get a great experience using BlackBerry and Window mobile phones too. Each one has its pros and cons but all work relatively well when playing at JokaRoom. The progressive jackpots featured at JokaRoom are probably not the kind of progressive that you will have heard about everywhere but there are still a number of popular ones. You can choose from progressives like Good Girl, Bad Girl, Slotfather, Greedy Goblins and the new game, Dragon Kings. All of them are great slots to play and offer some big winnings. When you join up to JokaRoom Casino and claim the welcome bonus, you'll get up to $2,000 free in a matched deposit bonus but also get yourself 75 free spins. These will be given out to customers in a tiered method and the free spins, 25 for each deposit, will be usable on Wolf Treasure. There are many different promotions on offer at JokaRoom and you can claim one on every day of the week. Monday will give you the choice of picking one of five doors to get given a casino bonus. Tuesday will get you a 60% matched bonus, 60 free spins on Goldilocks or a 40% match bonus plus 20 free spins. Wednesdays give you a choice of 2 different offers with either an extra 35% or 70% upon depositing a certain amount. These are just some of the many deposits on offer with JokaRoom Casino and you can claim more on Thursday, Saturday and Sunday, as well as sign up to the loyalty program and try to earn some rewards as you play. They'll all give you an added bonus to your real money whenever you decide to play. As previously mentioned in the review, JokaRoom wants to be in a position where the customers get the best experience possible. This extends into the customer service on offer. There is a fairly comprehensive FAQ through JokaRoom where you'll be able to answer most of your burning questions. If not, there are other ways to find the answers. You're able to contact JokaRoom through email, telephone or live chat. The email will direct you to two different areas, player support and banking/accounts. The more information you provide in the email you send, the fast they'll be able to assist you. You can also phone JokaRoom, although the hours aren't specifically listed on the website, and there’s also the Live Chat feature which is available 24/7. The wide selection of banking methods on offer at JokaRoom isn't exactly the widest list we've ever seen, but it does certainly allow players to have a bit of choice. In terms of deposit, you'll be able to use credit and debit cards as standard, so VISA and Mastercard are both approved. You can also use a pre-paid card in Neosurf. For withdrawals, your options are a little more limited, you'll only be able to withdraw using a VISA credit card, but will also be able to take a Bank Transfer into your account. There is currently no support for cryptocurrency at JokaRoom. Naturally, the banking options for withdrawals will take a little longer than usual. On their site, JokaRoom lists that the payout timeframe is between 3 and 5 business days for VISA credit cards and bank transfers. Obviously this kind of estimate is down to the middle-man here, because JokaRoom can accept no responsibility for how long your withdrawals would take. There will be a short processing time for JokaRoom to assess and pay out when you submit the withdrawal request though, so be prepared to add that into your time frame. Having only been in the online gaming industry for such a short time, JokaRoom seems to be a casino that has a lot to offer its users. There may not be as many games or providers as some others and perhaps the payment and banking options leave a little to be desired. There is never any perfect casino and the options that JokaRoom offer to you put it right up there with the very best. The selection of games is both fresh and exciting and the site itself is a pleasure to play on. Since the site is new, it also boasts social interaction with fans online and makes support one of its primary features. If you couple all of this along with the bonuses and promotions, you'll always be in for a treat when playing at JokaRoom. Our review team believes that if JokaRoom can get perhaps a few more banking options on board, and maybe another provider to bring some top quality progressive to the selection, then JokaRoom will be a really strong contender in the Australian online casino market.